A jig ambushed from the side. My son, an avid pike fisherman, turned me onto an interesting tidbit about information to be gained from the position of the hook in caught fish. 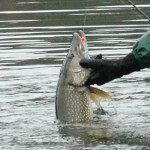 Pike apparently prefer to ambush prey from the side and so tend have the hook embedded in the side of their mouths. When they miss their first strike and end up chasing down the lure then they tend to hook up in the front of their mouths or deeper inside their mouth. I’ve also just read a good article from Jon Storm in B.A.S.S. Times  that mentioned a similar idea for bass. 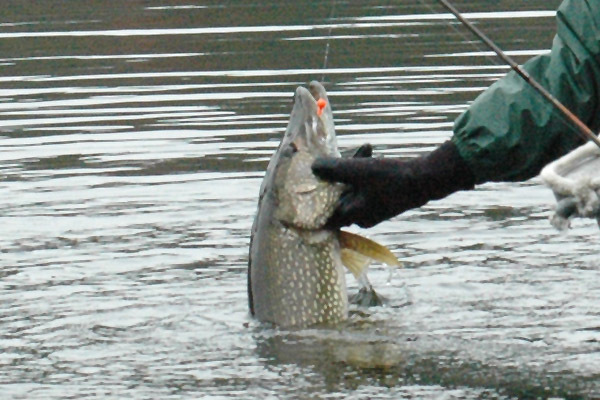 A lure deep in the mouth means fish are on the bite and may mean you can get more aggressive with your retrieve. If just the rear hook is in the jaw then they are just nipping at the bait – slow down or add pauses to your retrieve. If it is on the side of the mouth, it is likely from a reaction bite – you may need to change casting angle, or adjust color somewhat (i.e. increase visibility and/or time that the fish sees the lure). The Mepps Comet in the side of this white bass’s mouth suggests a reaction strike. Jon Storm “Dialing In: Deep Crankbaits with Brett Hite” B.A.S.S. Times, 44(8) (2014) 17. Largemouth Bass, Northern Pike, Tips.